Vultures are one of the most misunderstood and least appreciated birds in the avian world. Many of the opinions formed by people are based on the way vultures are portrayed in movies and cartoons. A lot of you probably believe that when vultures are circling overhead, they are waiting for an animal to die. Vultures certainly circle, and can soar for up to six hours without flapping, but they are simply using the thermals to move from place to place. Another belief that some people have is that they are dirty, disgusting birds, when in fact, if there is a water source available, most vultures will enjoy a bath after a meal. Yes, they eat dead animals, and often don’t find them until the animal has been dead for a day or two, but they do have standards. Even vultures like their meat fairly fresh, and often by the fourth day, they will not feed on carrion because the meat is too rotten. Some people find vultures ugly because of their almost bald head, but does that make them ugly? There are certainly a lot of bald men walking around, and some are bald by choice, does that make them ugly? Just try to picture a bird with a feathered head, reaching down inside a carcass. Now that would be ugly! Not only do vultures not pick up many food scraps on their head, what they do pick up will easily wash off, or bake off in the sun. Below are six of my favorite interesting facts about vultures, which I hope will help to convince you that vultures are truly fascinating and wonderful birds. Suli helping to teach people how wonderful vultures are. 1) If you know anything at all about vultures, then you probably know that they eat, almost exclusively, carrion (dead animals they find). I like to think of them as one of nature’s clean-up crews. But did you know that they can also prevent diseases? Their stomach acids are so strong that they can feed on animals that have died from such things as botulism, anthrax, salmonella, and cholera without causing the vulture to become ill. In fact, their stomach acids actually kill the bacteria and toxins! If a group of vultures consume an infected carcass, the harmful bacteria or toxin is destroyed so that it can no longer spread to other animals or humans. Suli enjoying a delicious bone. 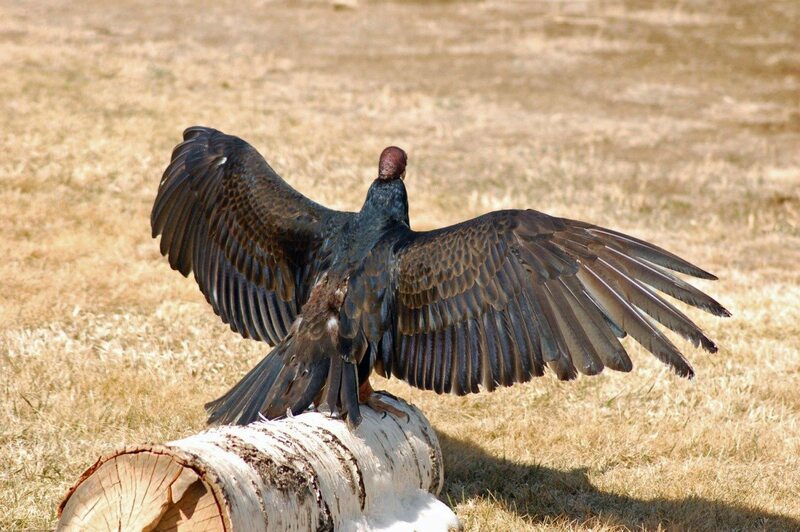 2) Turkey vultures have a great sense of smell. They can smell the gasses coming off dead animals from, possibly, as far away as five miles. This ability allows them to find carrion even beneath a forest’s canopy. 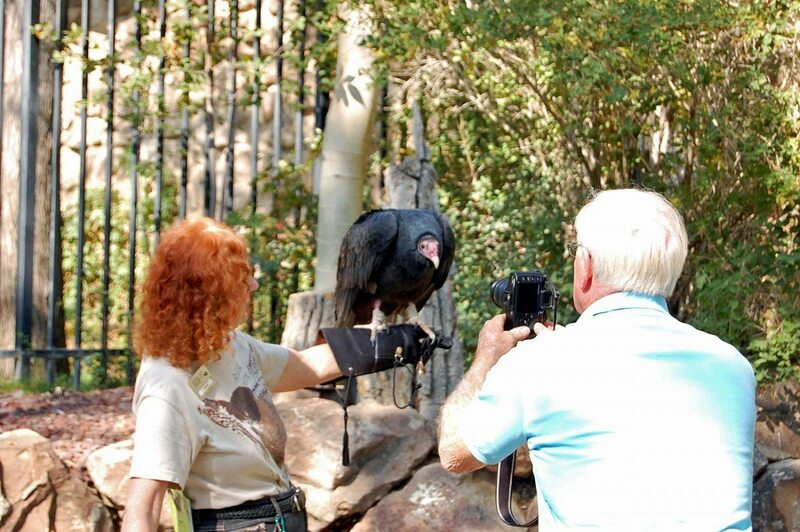 As you look at Suli, our turkey vulture, you will see a structure that most people think is one large nostril. This is not a nostril, however. It is a bony structure that protects her nostrils from getting food in them as the vulture feeds. They actually have two nostrils, located just above this opening. 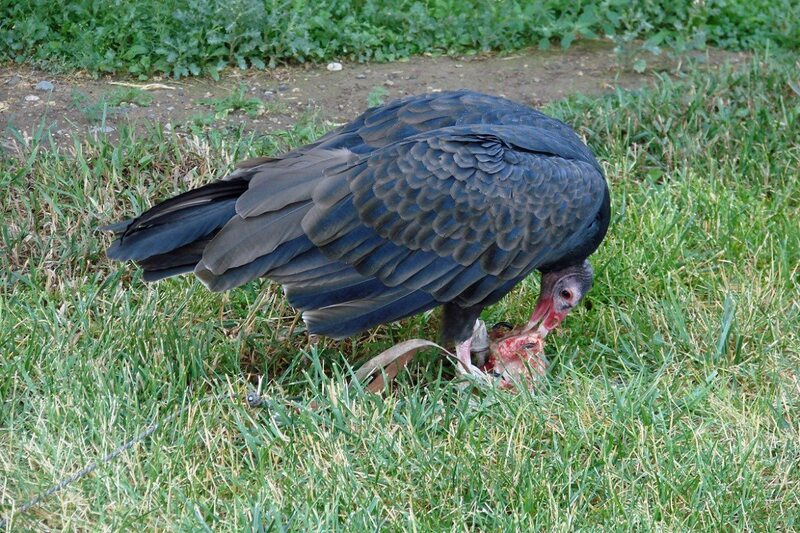 If a vulture puts its head down inside a carcass, and gets bits of meat or fat scraps in this opening, the vulture can easily pick it out with a talon. Suli showing off the boney structure protecting her nostrils. 3) Have you ever heard the sounds a turkey vulture makes? More than likely the answer is no. Turkey vultures do not sing, cackle, scream, or call out in any way. This is because they do not have a voice box. So do they make any sounds at all? With no voice box they are very limited, but they do grunt and hiss. I have heard Suli hiss a number of times. She does it when she is alarmed, usually when she sees strollers, as she is somewhat afraid of objects with wheels. So turkey vultures don’t have a lovely voice to serenade you with, but they do make quiet neighbors. 4) Turkey vultures love to sun themselves. When Suli is perched upon my glove, she spreads her wings the instant I walk into the sunlight. This is called a horaltic pose. It is believed that the vulture does this for a variety of reasons. If you observe vultures first thing in the morning, you will see they are standing in this horaltic pose. A vulture’s body temperature drops overnight, and this pose will help the birds to warm up. This pose is also used after bathing to dry their feathers. It may also help to bake off bacteria the vulture has picked up while feeding on carrion. Suli in her horaltic pose, enjoying the sun in our weathering yard. 5) Okay, here is a gross out fact that has good use. Kids love this one! Turkey vultures urinate down their legs. This is called urohydrosis and it helps to cool the vultures off during hot weather. When the fluids in the waste evaporate, it cools the blood vessels in the feet, therefore lowering the overall temperature of the bird. It is also believed that because of the high acidity of their urine, the bacteria on their legs is destroyed. 6) Another gross out that kids, as well as adults, love, is that turkey vultures use vomit as a way to protect themselves from predators. Depending on the sources you read, some people believe that they projectile vomit while others simply state that they cough up semi-digested food. In either case, if a vulture feels threatened, they vomit. You can imagine that the food they eat is often smelly. It’s even worse, however, when coming up. This will often stop predators in their tracks. Sometimes the threatening animal will decide that the nice warm vomit will make a good meal. Ewww! According to the book Raptors of New Mexico edited by Jean-Luc E. Cartron, “Both Bald Eagles and Golden Eagles have been observed chasing after Turkey Vultures, causing them to regurgitate food that is then consumed by the eagles.” Also, since birds in the wild can not always eat on a daily basis, they may gorge when food is available. Sometimes this increases their weight to the point that it is difficult for them to gain flight. Vomiting, therefore, lightens their weight, allowing the bird to take off faster, which gives them a better chance of escaping. This is also true of large birds such as eagles. So, if you spy a vulture or eagle on road kill …slow down! The bird may not be able to fly from the carcass quickly. Suli in her mew (the room that is her home). 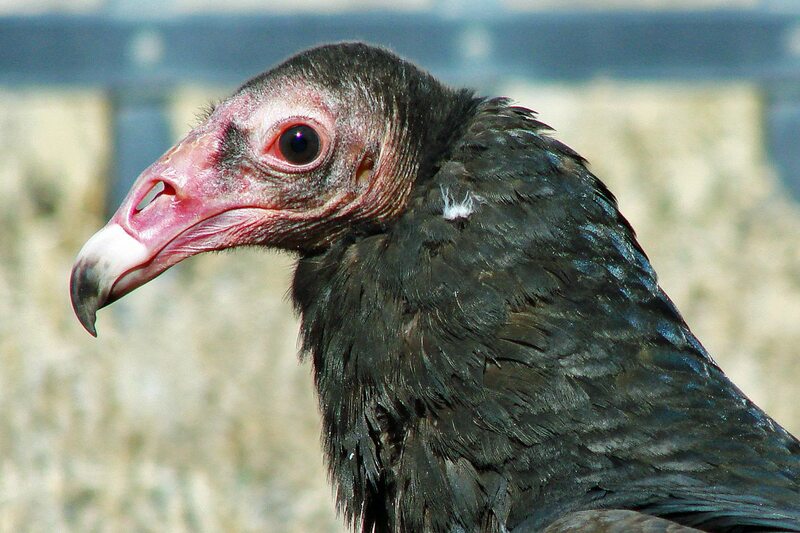 Are turkey vultures related to buzzards? 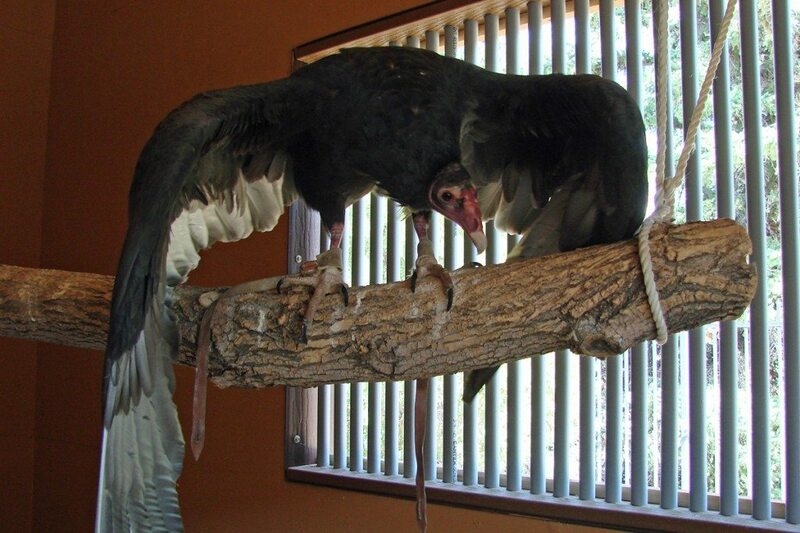 Turkey vultures are sometimes referred to as buzzards, although they are not really buzzards. Buzzards are really hawks of the genus Buteo that live mainly in the British Isles. In some areas of our country, however, vultures are commonly called buzzards. This term was probably used by early settlers who arrived in this country, saw our vultures, and thought they were buzzards. New World vultures are not even related to hawks. DNA shows that they are more closely related to storks. Storks, in fact, use urohydrosis to cool off, just as turkey vultures do. 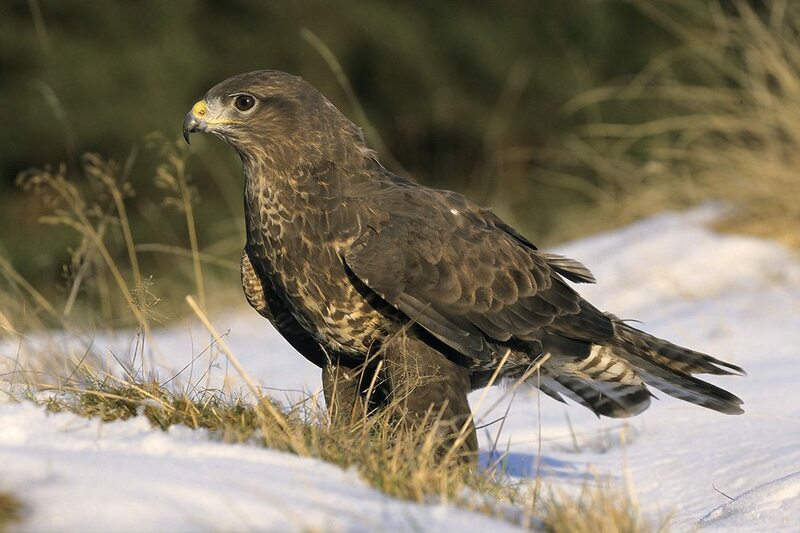 Common buzzard (photo from a free use website).